Series One: Killer vs Sky- The Sky isn't the limit! Game 1 (Circuit Breaker): Killer opted for an expansion first vs forge FE from Sky to open the game. Both players were rather passive as Sky went for Stargate and citadel on two bases while Killer got a 3rd in response to Sky's expansion eventually taking a 4th. Some harass occurred with the corsairs but there wasn't much damage done. A dt did manage to sneak in and kill 4 drones at Killer's expansion with a followup zealot attack costing Killer a lot of drones and several overlords due to lack of hydras. Sky would eventually take his third at the mineral only while Killer transitioned into mutalisks+scourage. This caught Sky offguard as he lost all his corsairs and lots of probes in the main and expansion. From this point, Killer became aggressive attacking Sky's 3rd base then doing a double attack where Sky lost both his expansion and 4th promoting the gg. Game 2 (New Heartbreak Ridge): Being cautious of the possibility of cheese, Killer opens pool first against Sky's forge FE build. Both players were passive as they both expanded with Killer also grabbing a third and getting his lair. A small speedling group dispatched by Killer managed to take down the cannon at Shuttle's expansion before running into the main and killing some probes. Sky stuck to his game one plan of stargate and citadel while Killer got a spire and a hydra den. Seeing an opportunity, Sky ran a control group of zealots into Killer's main only to lose them all. Killer counterattacked with mass hydras easily busting Sky's front to go up 2-0. Game 3 (Neo Medusa): Killer once again opened with pool first however Sky was looking to take the eco lead by going nexus first. Killer put on some aggression as he made some zerglings and went for the runby while he double expanded. Though his zerglings were blocked, 2 managed to make it in and kill several probes. Lair got started for Killer with a spire morphing soon after. After going up to 3 gates and a citadel, Killer managed another runby into the main that sniped the main pylon powering the new gateway and citadel. With only 3 zealots to defend his base, Sky called the gg. Game 4 (Neo Electric Circuit): Being down 3-0, Sky went for one of his usual cheeses, a proxy 2 gate. However, Killer goes for safe play again opening 9 pool and getting a full scout. He then decided to grab his mineral only back expansion and made only zerglings intending to take down the pylon powering the 2 gates. 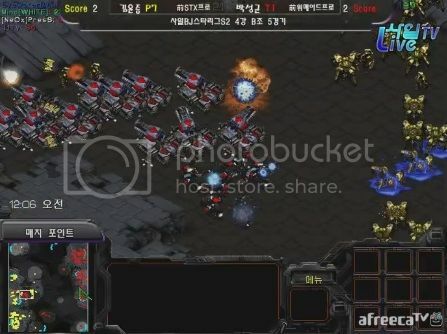 After 2 zealots are surrounded in Killer's base, Sky ggs giving Killer the clean sweep in 4 games lasting 38 minutes in total. Killer is our first finalist! Series Two: Mind vs Shuttle-Mind caused Shuttle to crash! Game 1 (Circuit Breaker): Mind started off by going for 1 rax FE after building his rax on the low ground. Shuttle ended up going for a 1 gate opening before double expanding with his third at the mineral only. He ended up adding a robo soon after and goes for observers first. Mind decides to get a fast third cc after adding 2 fac and goes for a small vulture runby to snipe probes at Shuttle's 3rd which fails. A bit after Shuttle cleans up the last remaining vultures, Mind grabs his 4th. This gets scouted by Shuttle who goes in for an attack while transitioning to 2 stargate carrier. Mind holds and pumps out goliaths in anticipation. 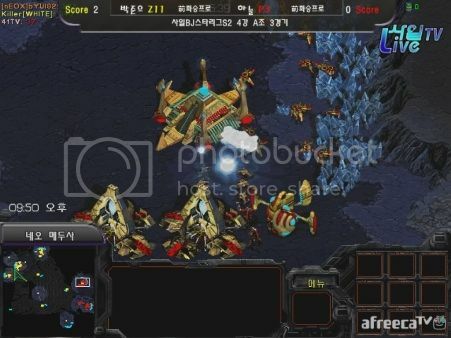 After a positioning battle, an engagement in the middle of the map saw Mind lose his army with Shuttle trying for counter right after but Mind had a strong defensive position. Macroing up another army, Mind managed to get another engagement in the middle. With brilliant positioning on his vultures, he managed to catch Shuttle's goons and wins the engagement. As such, he took another two bases and pushed into Shuttle's 3rd only to be repelled. At this point, he had the much better eco, the bigger army and much better upgrades. When Shuttle committed to take down Mind's 5th base, Mind seized the opportunity attacking from the high ground and decimating the remainder of Shuttle's army (minus carriers) to take game one. Game 2 (New Heartbreak Ridge): Taking a page from Sky's book, Shuttle decided to proxy gateway and go for a gas steal. Mind scouted the gateway as it finished wrapping in and added another rax. Early on, Mind looked to be in a good position as his second rax finished however some poor micro on his part saw him lose several marines and SCVs leading to a 1:1 ratio of marines and zealots. However, through sheer willpower and better micro, he managed to survive and recover eventually moving out and taking down the pylon powering the gateway. With such a large force approaching his base, Shuttle was forced to retreat and defend with the help of TWO shield batteries. After Shuttle won the fight, Mind gg'd out with the series tied at one a piece. Double shield battery, double power! Game 3 (Neo Medusa): As usual, Mind goes for FD against the 1 gate expand of shuttle. Robo for reavers is added soon after the second gate for Shuttle. Mind goes for a third mineral only base. Shuttle tried to deny it however he lost his reaver and a small army but did kill several tanks while at it. He ended up grabbing his own third soon after. Both players became really passive as Shuttle grabbed his 4th and went for another double shuttle drop which disrupted mining at Mind's 3rd. This was followed up by a storm drop that killed a lot of workers (pics). After a couple more bases were taken by the players and a failed double drop from Shuttle, Mind decided to move out with a strong mech army. Shuttle looked helpless as his 5th was killed with his 4th following soon after. Shuttle tried to use a couple of carriers to little effect though a small counter attack against Mind's 4th did kill some workers. Deciding that it's best to not engage Mind's army head on, Shuttle decided to attack Mind's remaining mining bases leading to a base trade scenario that Shuttle lost. Right on the money, I mean SCV! Like in game 2, Shuttle decided to go for a proxy gateway against Mind's factory expand who opted for mines. Shuttle tried breaking the front multiple times as he expanded but the spider mines+tank combo proved to be a bit much. Both players would eventually take their mineral only inbase expansion while trying to deny their opponent's 4th base with little luck. Mind constantly played the positioning game causing some major damage on Shuttle's army however he ended up losing the deciding battle in the middle of the map. This gave Shuttle a window of opportunity as his 5th just got established and he had the bigger army to get something done. Splitting up his army, he used his carriers to keep Mind busy at his 4th while using the rest of his army to take down Mind's 5th base. He eventually regrouped and took out Mind's 4th and almost got Mind's natural as well. In the meantime, Mind took out Shuttle's 5th base though he barely made it back in time to defend his own natural. The next attack from Shuttle was too strong as he ended up tying the series at 2-2. Shuttle sure loves his carriers! Mind started with a FD to the 1 gate expand of Shuttle who followed with a robo for obs. Mind decided to go for a hidden starport for a dropship. As he moved out on the map, Shuttle ended up circumventing his army walking straight into his expansion. Mind was forced to turn back to defend against this losing lots of workers in the process. Both players took their third at the mineral only with Mind getting some nice stacked probe kills with a tank drop. After building a sizable army, Mind sieged Shuttle's natural and managed to take down his nexus with a small followup attack. At the same time, he took a 4th base to increase his eco lead. Shuttle wanting to get something gone decided to attack Mind's 4th which didn't work out well. A major engagement soon after saw Shuttle lost most of his army aside from his carriers. Finally, Mind decided to go for the kill. Sieging near Shuttle's natural again, he forced Shuttle to counter attack since he couldn't engage. As this was going on, vultures destroyed Shuttle's 4th base leaving him with one mining base. Though Mind lost his 3rd and some buildings, he managed to hold on and defended well against another attack at his 4th while using the vultures from before to take out most of Shuttle's probes. With no mining bases left, almost no probes and a small carrier army, Shuttle gg'd and Mind went up 3-2. Another FD from Mind who went up against 1 gate robo followed up with an expansion by Shuttle. Shuttle ended up taking a third as he used a reaver drop to cause chaos in Mind's base however the reaver was lost. Mind took advantage of this as he took control of the bridge at Shuttle's natural to contain him. Despite Shuttle's best effort, Mind's contain was too strong and upon losing his natural, he was forced to gg to give Mind the series 4-2. With that, Mind is the second finalist! In , the finals of 41 Starleague Season 2 is set to start. The finals will be a bo7 played on the same maps as the semfinals. Our two finalists are none other than Killer and Mind. Two players that have shown some stellar games, good decision making skills and great control. You can be sure this will be a battle of epic proportions as both players are hungry for the win. Mind is looking to get his first tournament win post-Kespa while Killer is looking to add to his many first place finishes and to seize greater control over the throne of best Zerg! Mind has made his way to the finals on the backbone of many Protoss and Terran players. Starting in Ro32, he finished second in his group losing to Larva 2-0 in the winners match but beating Ample 1-0 and Free 2-1 in the deciding game. In the Ro16, he would also advance in second place after losing the initial game to Shuttle but 2-0ing ZerO in very convincing fashion and winning Mini 2-1 in a close game. The elimination stages saw Mind clean sweep Cola 3-0 before he beat Shuttle 4-2 today to get to the finals. 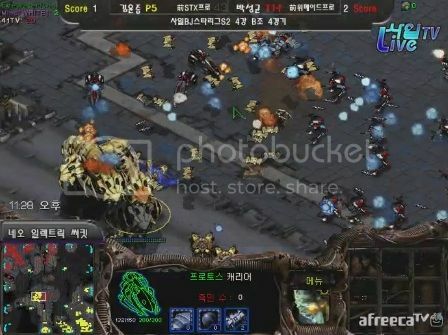 In all, he's faced three Zerg players in Larva, ZerO and Cola. None of these players are on Killer's level though and all of them have poor ZvT records to boot. Based on that, losing to Larva should be of some concern. His current vZ win rate sits at 80% however a further look at his opponents does reveal players that are a notch below Killer in the ZvT game. Mind has faced Killer once before, back in 2014 Gabangpop 1st Sonic Proleague where he won him on Neo Jade but that's a bit far back. Overall, Mind's games does show promise. His control in his vP is phenomenal and he's not afraid to change builds on the fly as is evident in his second game against Shuttle. He's also taught me that it's not safe to bet against him after he 4-2'd Shuttle. Killer, a name that's all too familiar to everyone in the Afreeca scene. Having reached many finals and predicted to make it to this final, it's no surprise that he's made this far and wants to go all the way. He's beaten many notable players to get here. Starting in the Ro32, he beat 1023 1-0 before topping his group after a 2-1 win against ZerO. In the Ro16, he ended up taking second place after losing to sSak 2-0 but 2-0ing hero to knock him out. The elimination stages saw him go up against HoGiL in a close series where he managed to edge him out 3-2 and just today, he clean sweeped Sky 4-0 showing that he can adapt on the fly. All in all, his ZvZ and ZvP game is strong however his ZvT is his weakest matchup which is usually the case for many players. ZvT is Killer's Achilles' heel. His current win rate stands at 55% compared to 75% for both of the other matchups. He's lost to many Terran players including Mong, Sea, PianO and even Shinee. That's not to say that all these players have weak vZ but it's to indicate that his vT needs work. Anyone who has been following Killer's games since SRT will realize one thing, Killer likes to live on the edge. While other Zergs might opt for a safe game plan to get to mid or late game, Killer tries his best to get there with less defense. Anyone who remembers his SRT games against Sea will remember how Killer has lost won games or has lost in the silliest ways due to this style of play. His recent game against Sky saw him take lots of damage at his expansion due to only having one sunken in mid game. He does seem to make it work though it's not a guaranteed thing as is evident by his win rate. So, what's the point? Seeing as Killer is not as successful in vT as his other matchups and Mind is a decent player in vZ based on his recent results, the possibility of Mind beating Killer and winning the finals isn't really farfetched. If Mind ends up studying Killer's style, he may be able to find that hole in his game and come up with strategies to punish him. Killer's mutalisk micro is stellar though so he should be able to make it to the late game where he'll have a better chance to combat Mind. Mind does have good mech control so depending on how well he transitions, he can still win in the late game. In other words, this series is hard to call because there are a lot of unknown variables however I predict that Mind will take this series 4-2 and finally win his first tournament! Hope you guys tune in to watch some TvZ action! Semifinal vods will be uploaded in the vod thread in a bit so stay tuned! Looks like good games in the second series, I'm gonna have to watch some. Too bad I'll miss the finals live but hopefully Mind can do some magic ^^ Thanks for the writeup! On a related note, thanks for the recaps and previews and the sharing of the terrific VODs for these tourneys!!! Damn Protoss has been doing terribly lately. Between this and BCTV Starleague... But I'm also quite happy to see Mind having a shot at a tournament.